I could use this card so much!!!!!!! LOVE Totally Target on facebook!!!! I already like TT!! Your matchups are superb….TT is defintely my go to site for all things Target!! clever gift card. I like you on FB and have for some time! Would Love to WIN! !! Love the bubbles, and does anyone see the hidden Mickey? What a fun, cute card!! As always, I’d love to win this! Thanks for the opportunity! Cute gift card!!! Thanks for the giveaway! I love playing with bubbles! I’d love to see how far I could make this $50 stretch! And I like Totally Target on Facebook!! Thank you for the chance to win! I already “like” you on Facebook!! 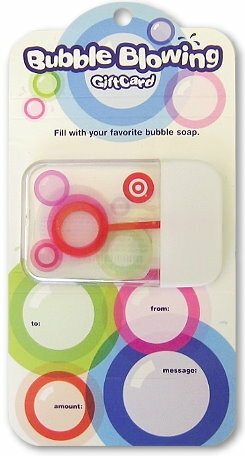 I already like Totally Target : ) Its great!! What a fun gift card 🙂 Would certainly love to win the $50 to Target. Super fun – thanks for the giveaway!! So awesome I’d love to win! tha.ks for another great opurtunity! One of my new favorite websites!